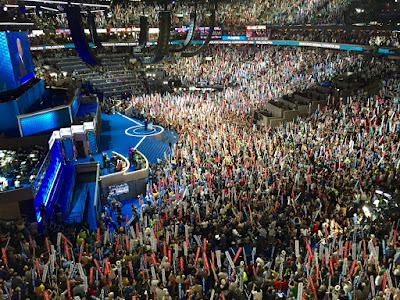 Wednesday is "Day Three" of the Democratic National Convention. Here is my Convention report covering Wednesday morning and the Convention presentations on Tuesday. Tuesday, of course, was "Day Two" of the Convention. To give you an idea, the photo above shows the crowd on the Floor, as former President Bill Clinton came to the podium to speak on behalf of the now-official nominee, Hillary Clinton (or Hillary RODHAM Clinton) as she is most frequently referenced. Today (Wednesday), at the California Democratic Party breakfast, I sat at the table with Tom Hayden, and I said hello to former Marin County Supervisor Barbara Boxer (she's a United States Senator now, and she was following up on her Tuesday Convention speech for Hillary Clinton with another speech to her California compatriots at the breakfast, saying farewell). 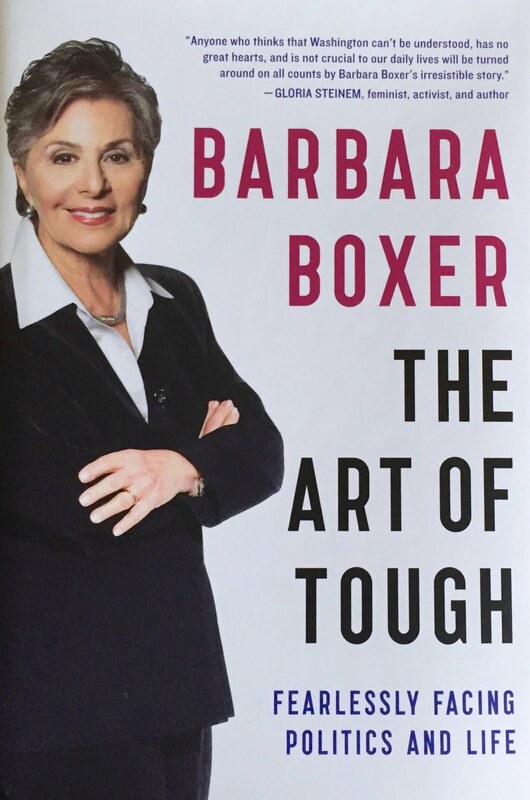 Oh, and incidentally, Barbara was also selling her book, The Art of Tough (picture below). 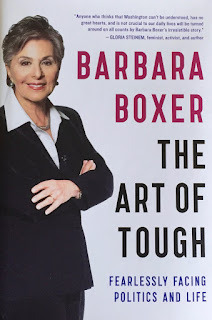 I have always liked Barbara, and have also been rather proud that BOTH of our United States Senators are former County Supervisors. The best politics is always at the local level, where officials can better be held accountable to the people they are supposed to be representing. Some local government officials do remember how it's supposed to work, and keep in real touch with real people, even when they start operating at the national level. Barbara is certainly one of those. Another example? Bernie Sanders, the former Mayor of Burlington, Vermont, which is how I introduced him when he was campaigning against fracking in Monterey County. Not Tuesday, but Monday, I did also see former California Governor Gray Davis, looking just like a statue on Easter Island. Through all the tumult and roiling upset on the Convention Floor, he never moved; he never smiled; he never blinked; he never even turned his head! Much more animated was former State Treasurer Phil Angelides, who flew in from Oregon, yesterday, to vote as one of those Super Delegates. I saw him in the lobby of the Downtown Marriott, the headquarters hotel for the California delegation, and Phil appeared super relaxed, with knee-length shorts and a big smile. Phil is in frequent contact with Santa Cruz resident Cathy Calfo, his former staff member, and while I live in Santa Cruz, and might be expected to see and be in contact with Cathy more frequently than Phil, who splits his time between Sacramento and Bend, Oregon, Phil's last word to me, as I headed off for a subway ride to the Convention, was, "I'll give your regards to Cathy." I hope he did! Cathy heads up the nonprofit organization California Certified Organic Farmers (CCOF), a trade association advancing organic farming not only in California, but nationwide. I promised, in an earlier posting, that I'd say something about "love." Here's something, but with a bit of a preface, first. On the first day of the Convention, a day full of tension, speakers kept referring to Hillary Clinton as "our candidate," and as "our nominee," prior to the nominating vote actually having occurred. As I reported earlier, this infuriated Bernie Sanders Delegates, who had actually come to the Convention thinking that there would be a vote on that very issue of who would be "our candidate." Naturally, the Sanders' Delegates wanted Bernie, not Hillary, to represent the Party, and so they almost always "booed" when Hillary's name came up as "our nominee," since all such references to Hillary made clear that the Sanders Delegates were irrelevant, as far as the Convention organizers were concerned, and that they ought to just go home and forget about it. The "booing," of course, naturally infuriated the Clinton Delegates, who hold Hillary Clinton in high regard. The dynamic just described is why the Convention on Monday was so full of tension. It was a self-inflicted wound by the Convention organizers, in my opinion. The Easter Island presence of Gray Davis, amidst the tumult, seemed extraordinary because of the contrast between Davis' demeanor and what was going on all around him. This stone statue gaze also, in some ways, symbolized the effort of long-time Democratic Party officials to endure the tumult, and not show the strain. There was another tactic used by the Convention organizers, too. That was to pass out cardboard signs with prepared "messages," these messages to correlate with the orchestrated speeches. These signs were intended to give an illusion of concord and unanimity in a crowd that was anything but of one mind and at peace with itself. One of these signs said, "Love Trumps Hate." There's my "love" reference. 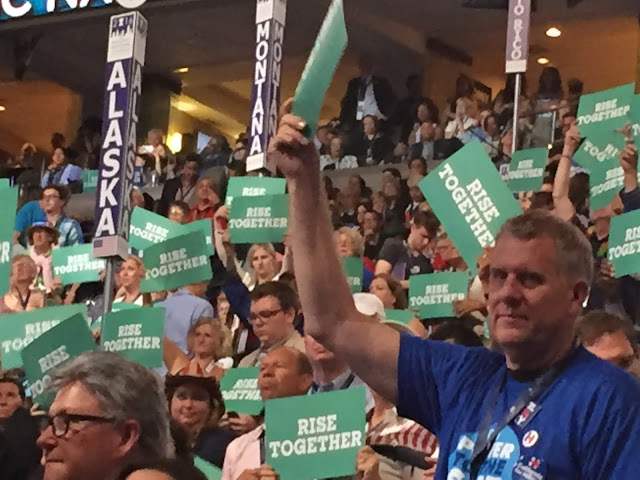 Another one of these signs, which presented the overarching "theme" that Convention organizers have decided should epitomize the gathering, read "Stronger Together." 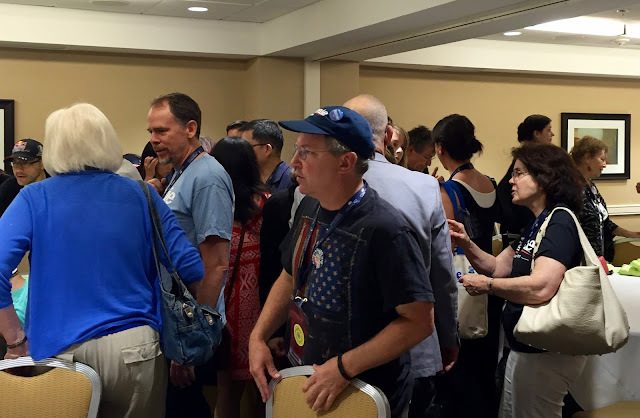 Unfortunately, at least from the perspective of a Bernie Sanders Delegate, this preprinted effort to impose a unanimity and loving harmony on the Convention, when that sentiment was not a reflection of the realities, did not actually go down that well. At least, that's my view. Trying to speak for others is always hazardous. If you claim a right to present what people are thinking, and they don't actually think that way, resentment is an inevitable result. Silent resentment. Or vocal resentment. Both kinds have been present at the Convention, again because the Democratic Party apparatus has presumed that it could characterize its Convention without taking into account that a large number of the attendees were alienated from the process. By the way, one of my closest friends pointed out that the phrase "The Party," used in the manner I've just described, carries a kind of totalitarian connotation, since that's how the Russian Communist Party was characterized until Glasnost, and is still the way that the Chinese Communist Party is characterized today. Since the Democrats are going up against a candidate who can properly be described as "totalitarian" in his basic instincts, it would be wise for the Democrats to drop references to "The Party," and to exemplify and practice "democracy," as their basic mode of operation. I don't think there is any doubt that a political movement, and a nation, is "stronger together." The description of the Convention, and the Democratic Party, in those terms, however, really needs to come from real life experiences, not manufactured unanimity. "Diversity" means real diversity, which ipso facto acknowledges and celebrates that we are, truly, different, and have different perspectives and ideas. Differences, when real diversity does come together, makes for a very, very strong bond. That is true at the "atomic level," even. Opposite electrical charges attract. Similar charges push against each other and divide. At the Convention, organizers have been putting words in every speaker's mouth, as speaker after speaker has claimed, in identical language, that we are "Stronger Together." I think it's a mistake. It's a "party line," and it makes those speeches weaker, not more compelling, because they come across as propaganda, not as genuine statements of the speaker's feelings and beliefs. Cory Booker gave a wonderful speech on Monday (click the link to listen to it, if you missed it during the live Convention coverage). Booker urged all Americans to "Rise Together." The signs deployed, even as the speech was being given, undermined, not enhanced the power of Booker's presentation. My opinion, again. For what it's worth! I am going to end today's report with a brief comment on a topic that everyone here (and probably everywhere) is worrying about. What are those "Berners" going to do now? Will they divide the good guys and let Trump win? As a preface to giving you the little information I have about that topic, let me first say that the Roll Call vote held yesterday was, at least to me, impressive and energizing. That should have happened "Day One," before every one began claiming from the dais that Hillary Clinton was "our nominee." The Bernie Sanders Delegates (and I am one of them) don't think that Hillary Rodham Clinton is our best candidate to win the Presidency in November. However, any fair-minded person would have to say, after hearing that roll call vote, that Hillary did win the nominating process. Millions of voters heard their representatives express with great delight their support for Hillary Clinton, and the Sanders' Delegates got to hear the same from the representatives of their voters. The tally came in. Hillary got the numbers. Bernie Sanders made the motion to declare Hillary Clinton the Democratic Party nominee, and that should have been, and I hope it was, a reconciling moment, because going into the elections in November, there is no doubt that we will be "stronger together." I have a little footnote on the roll call vote, though. Bernie made a motion which stated as follows (realizing that I haven't gone back to get the exact words): (1) that the Convention suspend the normal rules; (2) that the Convention organizers tally and record the votes of each of the candidates; and (3) that Hillary Clinton be declared the candidate of the Democratic Party. Marcia Fudge, who was selected long ago to Chair this gathering, and who has been one of the main promoters of the line that Hillary Clinton is "our candidate" before she was actually elected, then presented Senator Sanders' motion to the Floor for action. 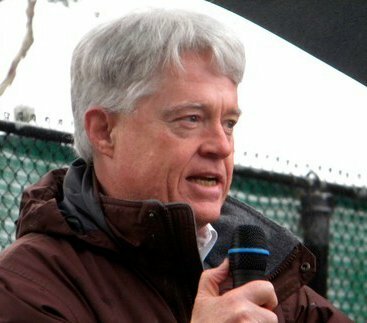 After the crowd quieted down, instead of restating the motion and asking for a vote, Fudge asked the Convention to "declare Hillary Clinton the winner by acclamation." In other words, Fudge lived up to her name, and tried to "fudge" the motion, by eliminating the part of the motion that required the recording of the actual vote! And you wonder why the "Berners" walked out? Well, what about those "Berners" who walked out? Will they come back, and work for Hillary Clinton? That will, actually, depend on what happens today and tomorrow at the Convention. So far, the Convention has been following a script that was prepared long ago, and that presumed that there would not be any difference of opinion about who should be the Presidential candidate. Well, now we know that a very large number of Delegates, representing real Democratic Party voters, don't agree with the premise that Hillary Clinton is the best candidate. So, now that Hillary Clinton has affirmatively demonstrated, through the roll call vote, that she does have majority support (under the current rules, including the Super Delegates) how can the Party recognize and celebrate the diversity that this Convention has revealed, and make the whole Democratic Party "stronger together?" The main Party apparatus, and Hillary Clinton above all, is going to have to reach out to the Bernie Sanders voters, and make common cause with them, or Hillary will go into the Fall election without the unified strength of the entire Democratic Party behind her. What if the President, when he speaks tonight, would not just extoll Hillary Clinton (and this is what all the speeches do)? What if the President called BOTH Hillary and Bernie to the stage, so they could all raise their hands together, for a "political revolution" that would deal with the major issues that both Bernie Sanders and Hillary Clinton know are so important to so many? What if Hillary Clinton, tomorrow, did something similar? The Bernie Sanders Delegates have made clear that millions of Democratic Party and Independent voters want our President to work for health care, not warfare. We want to end the massive income inequality that afflicts our society and economy. We want a $15/hour minimum wage. And no TPP. You want the Bernie Sanders' voters to support Hillary? If Hillary wants their support, she won't get it just because they appreciate her past good work, or because they want a woman President. Both those things are true, but what the Bernie Sanders' voters want is a genuine change in direction, a "political revolution" in these United States. The ball is in Hillary's court. She's the Democratic Party nominee now. Where will she lead us? Below is a photo of the California "Berners," who were meeting, after the breakfast. They are planning. They are not going to quit. I talked to a Florida Sanders' Delegate. In Florida, too, the Sanders Delegates are not going to give up. To use a phrase that is regularly chanted on the Convention Floor: "This is What Democracy Looks Like!" Hillary Clinton, newly elected as the Democratic Party's official standard-bearer, can now try to use the vitality and energy that is obvious everywhere here in Philadelphia, and make real one of the other phrasings that we are all chanting: This is What American Looks Like." Really interesting observations, Gary. I guess the signs are for the "social media" that do not post anything without a photograph, but I can see how it can make any well composed speech seem contrived. Behold the latest card-board signs lifted behind Hellary that cynically and flagrantly invite people to: "Love Trump’s Hate" !!! They are obviously proving that I have been Perfectly Right when I have writtenly expected the eminent pre-set Transfer Of H. Rod'Ham Into The Anti-Emigrants’ Camp Of D. Trump, Within Their Bi-Synchronized Chaos-Generating Framework Of Their Hidden Co-Combined Crypto-Plot, Aimed At The Instigating And Dragging Of The Ordinary Amerikans INTO THE AMERIKAN EDITION OF THE "ARAB SPRING" HYPER-DESTRUCTION !!! When this jump-transfer of Hellary fully occurs, and everybody understands then that the ''Says Of The 'Trumpy' Were In-Fact The Says Of The 'Crypto-Unified Establishment' Of The Qabbaala'', those emigrants of The Non-Qabbaala who had unwisely or foolishly accepted the TRUMPING\ROD'HAMMING WAY OF DECEPTION, shall suddenly feel that they are being pan-betrayed and left-in-the-cold, and hence subjected to the Hyper-Bleeding Super-Desolation Consequences Of Not Rejecting The Trump-Plus-Rodham Lethal Qabbaaly Bi-Styles Way Of Deception. According to a number of virtual 'By Way Of Deception' sources: ''The Amerikan flag consists of thirteen horizontal stripes, seven red alternating with six white. The stripes represent the original thirteen colonies…''. The second phrase looks like a Huge Deceitful Lie, in view of the historical past omission of the previous blue stripes of a former flag of the 18th centuary and the keeping of the white ones, and in view of what was said repeatedly about the red stripes representation of the "RIVERS OF BLOOD" or the "SEVEN RIVERS OF BLOOD" !!! Asserting this acutely-horrific threat, is the mega-shocking scene in the Qabbaala-produced "I, Pet Goat II" cartoon film, where the Amerikan Flag Is Being Torn Into Two Halves and then Two Human-Shaped Towers Get Demolished From Top To Bottom !!! This is no-doubt a Qabbaaly Proclamation of "A Pan-Amerikan Massacre Against The Goyeem’s Whole In Amerika" !!! I have previously warned against the Severe Dangers Of The Non-Qabbaala Emigrants’ Extended Stay Inside The Ex United States Of Amerika, and against their uncareful subjecting of themselves to the same mercilessly executed types of the drilled and rehearsed brutal acts that we have painfully beheld in THE "ARAB SPRING" COUNTRIES, like: Iraq; Syria; Libya; al-Yemen; Tunisia; Egypt; Sudan; etc. Now, if the expected shutdowns of numerous landports and airports and seaports are started up, the selling of the Non-Qabbaala Emigrants’ possessions and their escaping out of the U.S.A. territories shall become sadly badly difficult. If so shall become the critical situation for them, then at least The Non-Qabbaala Emigrants’ Families May 'INSIST' Among Themselves On Side-Stepping The Hazardous 'Sleep-Walking' Acts Behind The Qabbaala Tyrants’ Chaos-Begining Gangs, as they try to lure them to follow them into their Trappy and Artificial: Demonstrations; Sit-Ins; Clashes; Sabotage-Blows; etc. FOR YOUR SERIOUSLY ENDANGERED SAFTIES, DO NOT DO AS THOSE GOVERNMENTAL SECRET AGENTS DO AT ANY SITUATION WHAT SO EVER. THE GOVERNMENTAL FORCES SHALL SPARE THEM, WITH THEIR MARKED CAPS AND BALA'KLAVAS AND SHAMLAS AND BACK BAGS, AND THEIR HIDING CONTROLLERS SHALL ORDER THEM TO LEAVE THE CHAOTIC SCENES THROUGH SILENT MOBILE RINGINGS AND TEXT MESSAGES, AND THAT SHALL HAPPEN WHEN THOSE CONFRONTATION SCENES ARE FILLED WITH NON-QABBAALA VICTIMS. THEN THOSE GOVERNMENTAL FORCES SHALL START TO HIT HARD AND HARSH AT THE TRICKED TRAPPED PEOPLE. ARTIFICIAL ESCALATIONS SHALL FOLLOW SOON, LARGELY BY USE OF MIMIC-TERRORISM OPERATIONS, AND IF THE ORDINARY AMERIKAN EMIGRANTS SHALL NOT REJECT THOSE SLY NEFARIOUS FORGERIES AT ONCE, THE QABBAALAS SHALL ESCALATE ALMOST ENDLESSLY, UNTILL THEY SHED THEIR FLAG-DEPICTED "RIVERS OF BLEEDING", BY WIDE USE WEAPONS OF MASS DESTRUCTION INSIDE THE EX UNITED STATES OF AMERIKA !!!!! BY WAY OF TRUMPING, BY WAY OF ROD-HAMMING, NON-QABBAALAS YOU ARE DRAWN TO SURRENDER YOUR LIVES VIA PSEUDO-VOTING !!! Possibly one of the very few truthful phrases of the September-October 2016 #Domald-Hellary# couple of quasi-runners for the Ex-U.S.A. mock-presidency, is that which was said about the about 50 days that could greatly decide upon the fate of the next 50 years Amerika. Being secretly a red-devildom shaman and a blue-devildom shamaness of a humans-and-wealth-sacrificing Qabbaalian mythology, they both hold a combined horribly ominous pack of over-years intentions, towards the entire pan-targeted Non-Qabbaalian community in the North Amerikan Continent. Apart from the INTENSE BLACK WITCHCRAFT POWDER QUANTITIES THAT ARE BEING CURRENTLY CONTRAILED OVER AMERIKA, one of their other GREATEST PLOT-IMPLEMENTING WEAPONS OF NOW IS TO DRAW THEIR VICTIMS INTO SURRENDERING THEIR OWN LIVES VIA PSEUDO-VOTING, AFTER TELLING THEM *IT IS A PSEUDO-VOTING* !!! Thereat Looming Cosmic-Scale Threat, The Very Urgent Kind Of Questions That Should Now Be Breaking And Entering And Dwelling In Some Millions Of Hyper-Anxious Minds, Of The Amerikan Goyeem People, Are Like : Why for this year are the PSEUDO-ELECTIONS’ KRYPTO-CONTROLLERS, AND WITH FULL COOPERATION FROM BOTH D. TRUMP AND H. ROD’HAM THEMSELVES, ARE SUDDENLY NOW RE-PRESENTING AND RE-LAUNCHING Those Two Muppet-Show Hollow Dolls in such a “Couple Of Detestable Rejectable Political-Imagery Fashions” ?!?! ; Why for this year THERE IS SOMETHING LIKE AN APPARENT CHAMPIONSHIP BETWEEN THE ‘TRUMPING’ AND THE ‘ROD-HAMMING’ for the title of “Who Is The Most Corrupt of the Two of Them” ?!?! Why Both Sham-Elections’ Stringed Toys, THE ‘TRUMPY’ AND THE ‘ROD-HAMMY’, SEEM THROUGH THE MEDIA TO BE TOGETHER INTO A WEIRD INTER-COMPETITION Against Each Other for occupying the highest rank in “Betraying the Majority of the Amerikan Society” ?!?! — The unbeatable kind of explaining answer for that uneasable kind of worrying questions is fathomed-out to be : THE PSEUDO-ELECTIONS’ KRYPTO-CONTROLLERS, AND WITH FULL PARTAKINGS FROM BOTH TOP AGENTS D. TRUMP AND H. ROD’HAM THEMSELVES, ARE EXERTING THEIR ATMOST EFFORTS AND PRESSURES TO HAM-TRICK THE AMERIKAN NON-QABBAALAS AND DRAW-OUT THE GREATEST POSSIBLE PARTICIPATION OF THOSE MISINFORMED NON-QABBAALAS INTO THE QABBAALAS’ STAGED AND UNREAL ELECTIONS, SO AS TO DRAG THEM TO FALL INTO THE ULTRA-SINFUL POLY-SUICIDAL MASS-ACT OF *JUST CHOOSING ONE OF THE EXCLUSIVELY AVAILABLE TWO SATANS*, And Your Demise At Their Hands Shall Be Then Fast And Wieldy, You Naive Innocent-Minded Goyeem of Amerika !!! Note well that, in order to stress-up this super-criminal goal, there happened by the Controlling Krypto-Hub that super-odd placement of two more mock-participants in the pseudo-elections’ quasi-race, who are the other much more-humanized and much less-spotlighted ‘racing’ couple, that also ARE ORDERED TO ACT LIKE POTENTIAL SURE-LOSERS: Gary Johnson and Jill Stein. The Controlling Krypto-Hub compelled them to appear in front of the public, in-comparison with Do’mald Trump and Hellary Rod’ham, with way inferior charisma and unbelievable ignorance in aspects of Foreign Affairs and War Offence and Defence. By combining these Surely-Failing Character Portraits with the Aura of Good-Nature and Anti-Evilness, the Governing Qabbaala Hidden-Establishment is psycho-sensitizing the Non-Qabbaala Masses into a subconscious mental-connecting for the “UNTRUSTABILITY” of a White-House Runner with his/her “NICENESS” !! This automatically adds-up to the ongoing criminal mega-process of psycho-sensitizing the Non-Qabbaala Masses into a subconscious mental-connecting for the “TRUSTABILITY” of a White-House Runner with his/her “NASTINESS” !! Hence, any already threatened Non-Qabbaala Amerikan is sincerely advised NOT TO TAKE PART IN ANY ACTION OF THE PRE-SETTLED FAKE DECEPTIVE ELECTIONS, IF HE/SHE IS NOT WILLING TO SURRENDER HIS/HER LIFE OR HIS/HER SONS’ LIVES, WITH HIS/HER OWN HANDS, TO THE MURDEROUS INFLAMEOUS CORRUPTIVE DESTRUCTIVE QABBAALA LEADERS. Fellow Non-Qabbaalas In Amerika, Because Of The Qabbaalas' Ongoing Super-Diabolic Mega-Plot, YOU ARE AT THE VERY ENTRANCE OF YOUR "TRIBULATION YEARS", AND ON THE VERY BRINK OF YOUR "SUM OF FALL FEARS". Thereby, I Plead To You Dearly : If you do not want to shoulder-bear upon yourselves the super-sins of accepting AS A LEADER ANY OF THE DECEPTIVE CRIMINAL KRYPTO-AGENTS, like Hellary or Domald, WHO ARE TRIGGERED AGAINST YOU BY THE DECEPTIVE CRIMINAL KRYPTO-ESTABLISHMENT, do not get out to vote ; If you do not want to present your evil-plotting enemies with easy gifts of photo-and-video-proofs on their wide success in dragging your millions to confess at the voting stations their ABSOLUTE AUTHORITY AND UNCONTESTED GOVERNMENT UPON YOU AND YOUR CHILDREN, do not get out to vote ; If you do not want to subject yourselves to the forthcoming luciferian part-plot of claiming your totality of tens-of-millions AS BEING SPLIT INTO TWO IN-MUTUAL-HATE AND AT-UTTER-WAR HALF-PEOPLES, do not get out to vote ; If you do not want to allow them to subdue and soldierize your youths and teenagers INTO BECOMING SELVES-ANNIHILATING PAWNS INSIDE SOME REMOTE-CONTROLLED FACTIONS IN A "MEDAL-Of-HONOUR" STYLED REALITY BATTLES, do not get out to vote ; If you do not want to give them golden chances TO ALLEGEDLY ANNOUNCE THAT YOU ORDINARY STRAIGHT AMERIKANS COMPRISE A LOT OF TERRORISTS AND HENCE NEED TO BE 'DEPOPULATED', do not get out to vote ; If you do not want to cooperate with them in their mindless super-satanic hyper-inferno stage OF A SYNCHRONIZED LONG SURGE OF INTERCHANGED VOLLEYING OF NUCLEAR HEADS BETWEEN THEM AND THEIR RUSSIAN QABBAALA COLLEAGUES, SO AS TO FALL ONLY ON YOUR NON-QABBAALA VILLAGES AND TOWNS AND CITY-DISTRICTS, do not get out to vote. Take that right decision now, right now, and invite other super-endangered non-qabbaalas to join you, so that those badest cursed over-wicked unleal-to-Amerika qabbaalas understand fine that they have fatly failed, both By Way Of Trumping and By Way Of Rod-Hamming, to pull you into the highly regrettable hyper-sins flow of partaking in building for them their False-prophet-led "Crave New World", over an earth full of mutilated and burnt corpses of humans and animals and plants and houses and shops and vehicles ... etc. -- SO FOR GOD'S SAKE SAVE YOUR AND YOUR OFFSPRINGS' SOULS AND DO NOT GET OUT TO VOTE, AND MAKE THOSE BRUTAL PAGANS BEHOLD WELL ABOUT YOU : I HAVE NOT BEEN TAKEN BY WAY OF BEING TRUMPED, I HAVE NOT BEEN TAKEN BY WAY OF BEING ROD-HAMMED !!! !